The simple, unobtrusive lines of the classically styledOxford Ceiling Tilesin easy-to-clean white, our most popular colour, making them perfect for settings where subtlety is desired but boring just won't do. They have a versatile design that is great for ceiling border areas (where the walls meet the ceiling and less than full-size tiles are often needed) or put its classic styling to good use throughout the entirety of your ceiling. Oxford ceiling tiles are suitable for use in 1 in., 15/16 in. and 9/16 in. T-bar suspension grid but, due to their 3-dimensional profile, are not suitable for direct glue-up installations. Fasade Glue-Up decorative thermoplastic ceiling panels provides the classic look of traditional tin ceilings for a fraction of the cost. The ceiling panels feature quick and easy direct-apply installation with polyurethane construction adhesive. Whether you're remodeling an entire room or simply accenting a small area, these ceiling panels create an instant designer look. Unlike traditional tin panels that require decades to acquire an antique look, these ceiling panels have that turn-of-the-century authenticity right out of the box. These panels can be cut with a snip, scissors or utility knife for quick and easy installation. 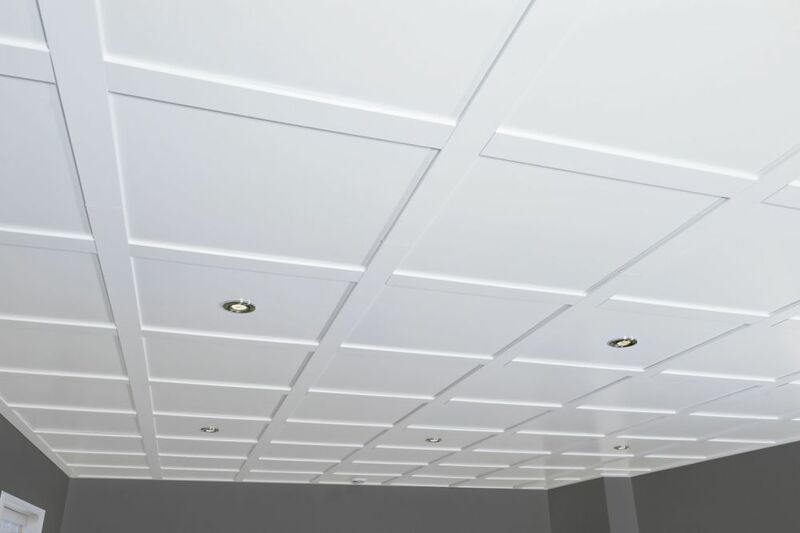 Genesis is the last ceiling panel you'll ever need to install. They are manufactured from cellular PVC with both smooth and textured surfaces available. Genesis tiles are perfect for commercial kitchens, food processing plants, healthcare and education facilities, marine applications, high-humidity climates and clean rooms. Suspended Ceiling tile kit 80 sq/ft is rated 5.0 out of 5 by 2. Rated 5 out of 5 by Gordon from Great look, but a bit more difficult to install Looks great, but is more difficult to install than it shows. You have to be exactly in line with the hangers to get it to line up. Also, the amount it covers is dependent on the shape of the room. Rated 5 out of 5 by Tamara from Beautiful when finished! We bought and installed this ceiling ourselves. Everything you need comes with the kit. It is a good product to work with and installed easily enough. Looks amazing! Yes, a kit includes everything you need except the screws. We recommend using #8,1-1/4 in. wood screws. Is a suspended ceiling set &quot;safer&quot; compared to drywalls? I just don't trust drywall screws to hold big sheets of heavy drywall on the ceiling (even when installed professionally). A suspended ceiling or drywalls are both safe options if installed properly. The main advantage of a suspended ceiling is that it gives an easy access to ducts, pipes and electrical cables at all times. The Embassy ceiling system also allows to replace pieces if needed. What is the width of the corss bars in inches. Hard to tell by the specs provided below. Are they 5.25 inches wide? The main and secondary crossbars are 3 inches wide. What is the dimension of each tile? Each tile is 24 in X 24 in. Are these ceiling tiles fire rated? Embassy ceiling tiles are not fire rated. Embassy suspended ceilings have similar acoustic and soundproofing properties as drywall. Yes, Embassy ceiling can be install on concrete ceiling. Make sure to use screws and fastening system made for this purpose. If the ceiling has a certain texture (popcorn ceiling), the first step would be to sand the surface so that it is smooth where anchors will be fixed. In terms of lighting, Embassy ceilings are indeed compatible with recessed spotlights. What is the width between supporting beams, I wish to put insulation rolls in between but can't find what width to use? Embassy ceiling rail &amp; anchor system allows a clearance of 1-3/4 in. between the structure and the ceiling. Your anchors will be installed at a distance of 16 or 24 inches depending on your joists.